Hotels-Accommodation.ro offers you an easy online-booking/phone support service for Bucharest hotels and provides helpful information with photos and details for each hotel in Bucharest. Book with us and get low rates for rooms in Bucharest hotels, all types of accommodation in Bucharest from budget hotel to luxury hotels, apartment rentals, cheap guest houses, budget pensions. Peaceful and quiet, a retreat from the city bustle, providing the ideal place to relax. At the end of the day, at Crystal Palace Bucharest you can comfortably sleep in the feeling that everything has been taken care of. Hotel Continental Bucharest being completely renovated was opened as a five star hotel in the beginning of 2007. Your reservation requests in Bucharest are welcomed starting now. Thanks to the comfort, intimacy and location in the business and cultural centre of Bucharest and for its facilities, Ramada Majestic Hotel is preferred by the businessmen travelling to Bucharest. "A history of 200 years"-founded in 1886, Hotel Casa Capsa in Bucharest is the oldest, elegant, classical and traditional hotel in Romania, which has good taste, style and discretion. Between Carol I and I.C. Rosetti Avenues, El Greco Hotel and Rodon Restaurant were open to render an intimate Greek universe in the heart of noisy Bucharest. With 7 floors, 88 rooms Minerva Hotel is one of the coziest 4 star hotel in Bucharest, located in the center of Bucharest, nearby the main train station in Calea Victoriei and the Palace Casino. Recently built, well appointed in Romana Square, few minutes away from touristic and commercial objectives in Bucharest, Unique Hotel renders a new idea of travel in Bucharest. NH Hotel offers easy access to city attractions (the Palace of Parliament, Cismigiu Park, Romanian Peasant Museum and National Art Museum). Otopeni Airport is 15 km from NH Bucharest Hotel. Bucharest Class Hotel is committed to be the business man's first choice close to Otopeni Airport, Baneasa Lake area, ideally located to offer easy reach toward center of Bucharest. Hotel Berthelot located 10 minutes from the main cultural and social objectives of Bucharest including: Romanian Athenaeum, Romanian Market, Palace Hall. Phoenicia Grand Hotel with an impressive architectural style is located just 3 minutes from Baneasa International Airport, making it ideal accommodation for business and beyond. Whether you come to Bucharest as a businessman or simply as a tourist, Christina Hotel is the ideal choice, located just 10 minutes from Otopeni Airport. Ramada Plaza Hotel, situated near the Romexpo Exposition Center, a few hundred meters from the Royal Station and 10 minutes from Otopeni International Airport. Ramada Park, a 4-star hotel located in the northern capital of Romania, instill an relaxed atmosphere conducive to business meetings. Pullman Bucharest, a 4-star hotel, located on the World Trade Center, 5 minutes from central Bucharest and 15 minutes from the airport, ideal for business and leisure. Rin Grand, a 4-star hotel, located in south-east of Bucharest, on the road Vitan Barzesti, intended successful business meetings, or relaxation on wellness center. Monte Carlo Palace, a 5-star hotel, located at Baiculesti number 29, Bucharest offers accommodation arrangements according to your expectations, relaxing and open to new. Radisson Blu Hotel, Bucharest, located on the main street, Victoria Avenue, near the Royal Palace, 20 minutes from Henri Coanda International Airport. Epoque, a luxury boutique hotel located in Bucharest downtown, close to Cismigiu, steps away from walking Romanian Atheneum, Opera House, or Royal Palace. This new built hotel offers quality services - comfort and lovely accommodation. Bucharest Gallery Hotel has wide rooms, with double beds, being centrally appointed for both business and tourism. Situated in the heart of bustling Bucharest, The JW Marriott Bucharest Grand Hotel brings modern sophistication to an emerging Eastern European city. Bucharest Comfort Suites Hotel, on Balcescu Blvd. is located in the heart of the city next to National Theater and a famous hotel, a few minutes from museums, shopping areas and clubs. Rin Confort Otopeni Hotel recently appears close to Otopeni International Airport in order to provide its clients friendly, 5 star services and quality usual for Confort Hotels in Bucharest. A lovely hotel in Bucharest, Nelisse, close to Bucur Obor area, provides lodging services or short rentals in its single, double, twin rooms or suite at some of the lowest rates in Bucharest. Ideally located in the heart of the Bucharest Business Community, within the World Trade Center complex, Sofitel Hotel is 5 min from the city center and 15 min from the airport. Diplomat Hotel in Bucharest, a new modern 4 star accommodation unit in the Romania's Capital is the best choice for business and leisure travelers, due to all its advantages. For your business activities in Bucharest or vacation in an European Capital, you can rent rooms at Bucharest Monte Nelly Hotel, located a few minutes from the University Square. Best Western Parc Hotel, one of 3 star classified hotels in Bucharest, comprises 267 rooms on 16 floors. 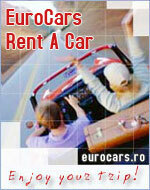 Located at 15 min away from Otopeni Airport and even less from the centre. The Howard Johnson Grand Plaza Hotel Bucharest is located in the very heart of the city center, overlooking the entire Bucharest offering the guests breathtaking panoramic views. Bucharest Persepolis Hotel has 8 stylish modern suites, 12 first class rooms rich in Spanish-oriental d�cor, fully equipped offering private facilities and extra large bathrooms with hydro-massaging showers. Bucharest Irisa Hotel, near Romanian Government, comprises 30 accommodation units (double, single, suites) supplying its guest with cafe bar, cable TV, safe, telephone. 4-star hotel in Bucharest, Golden Tulip Bucharest Sky Gate Hotel, offers comfortable lodging in the area of Otopeni International Airport, for both business and leisure traveler. Situated on Saint Pantelimon Island, the "Lebada" was a princess castle in the 18th century. Restored as a hotel, the buildings still preserve an outlook in harmony with the old ages. Lido Hotel Bucharest, by his design and services, is a familiar relaxation home, a second house for the customers � the majority being businessmen � once housed, they come back. Appointed in Baneasa-Aviatiei area, a growing business centre and residential locations district, the 4 star Bucharest Stil Hotel is opened since 2003, offering IT and communication services. Hotel 7, located in the center of Bucharest in a residential area, along with 18 embassies, in a precious building, provides intimate and comfortable lodging services. We are continuously engaged to provide premium accommodation services.